Soooo, onwards. We're still kinda hooked on veggies in Food Production class. 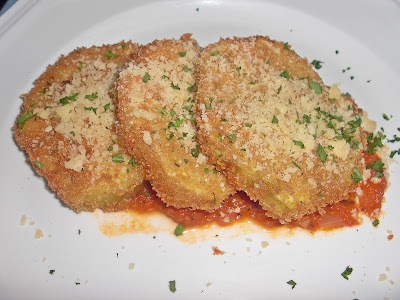 Two weeks ago, we made a pan-fried eggplant Parmesan. We used the tomato sauce that we made and immediately froze few weeks ago, which we thawed out and spruced up a bit with some fresh herbs. This dish was an exercise in the standard breading procedure (flour, eggwash, breadcrumbs). 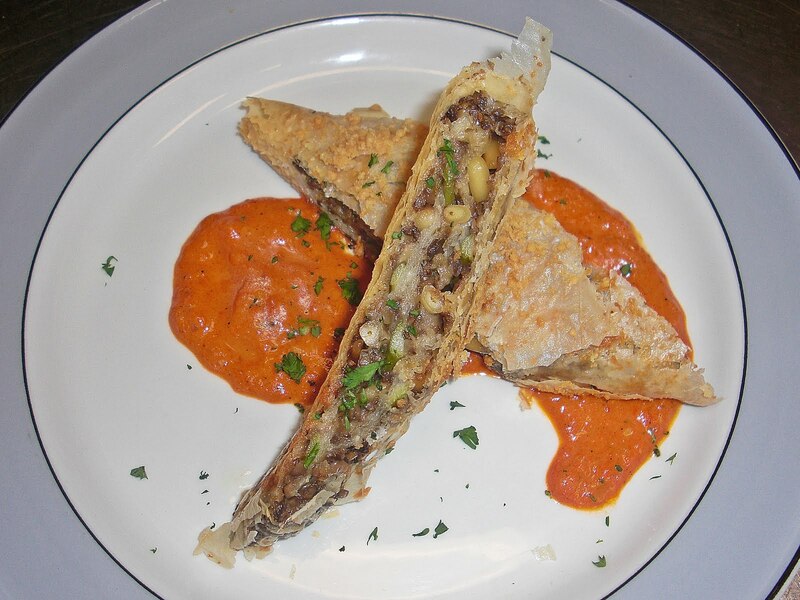 We also made a vegetable strudel: puff pastry layered with mushroom duxelles, blanched asparagus, toasted pine nuts, and Parmesan cheese. For the sauce, we made a simple red pepper coulis. The duxelles were really rich so I didn't really want more than a couple bites. Plus, I like mushrooms, but I don't absolutely love them. Regardless, I thought the flavor was right on. This was very filling for a vegetarian dish. 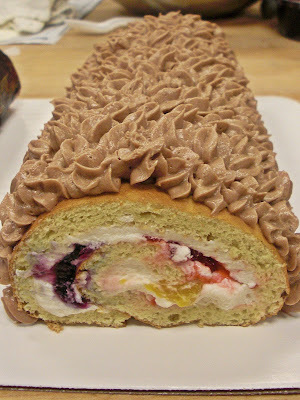 Two weeks ago in Bakeshop Production, we made jelly rolls. Although these tasted great, they seemed like such a strange, rather outdated desert to me. To make them, we baked spongecakes in a sheet pan. Then, we spread whipped cream on the cake, and lined the whipped cream with cherries, blueberries, and mandarin oranges. The cakes were carefully rolled up, then decorated with buttercream frosting or chocolate ganache. 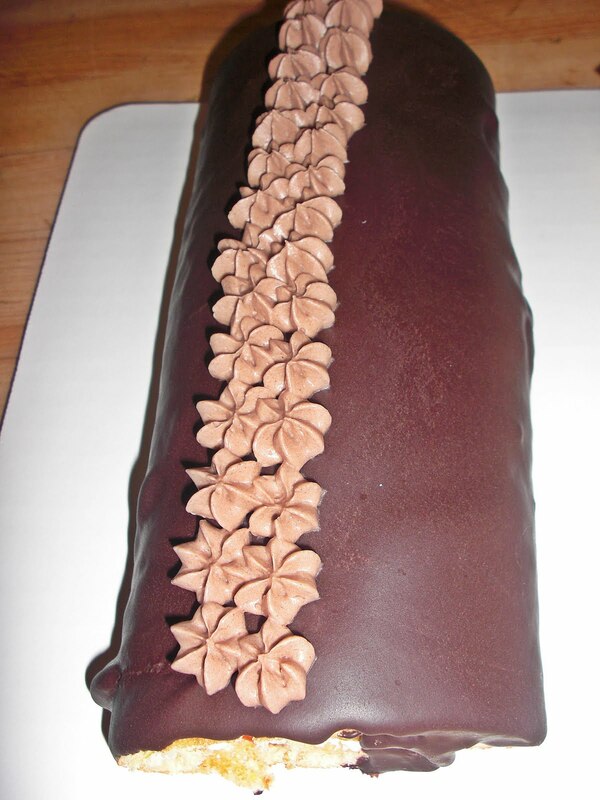 Allie's ganache turned out smooth and pretty, like it was supposed to. See all the fruit? I ate so much whipped cream and frosting during this class. Ech. That's about it for jelly rolls. 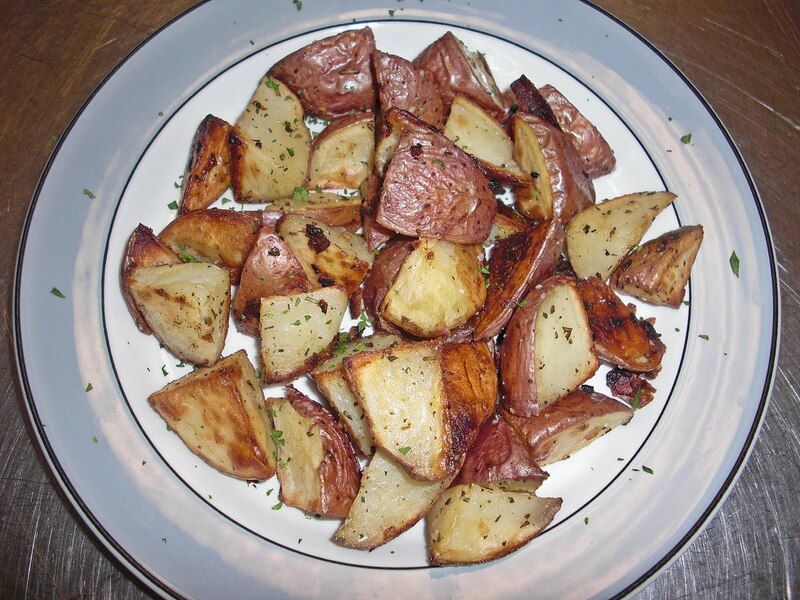 This week in Food Production, it was potato day. 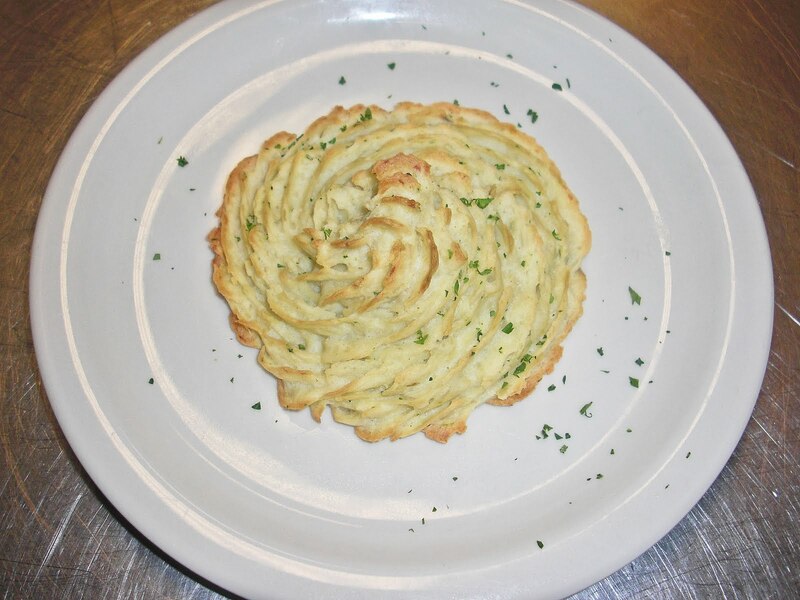 First, we made Potatoes Duchesse, which is kind of like mashed potatoes that are piped into little mounds and baked. Again, this seemed like kind of a weird recipe, but they tasted delicious. My partner, Mo, and I added some chopped parsley and cream in ours for a little extra flavor. I pretty much nibbled on these the whole class. 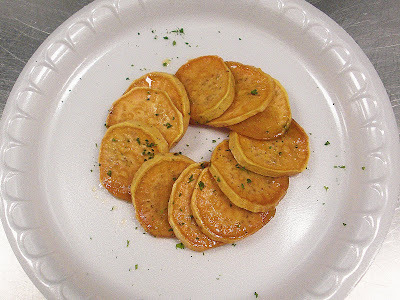 We made candied sweet potatoes that were roasted and basted with a syrup made from brown sugar and a hint of vanilla. We also made scalloped potatoes, which were delicous, but I kind of forgot to take a picture of them. In baking class this week, we each made a chiffon sponge cake and a walnut genoise cake. 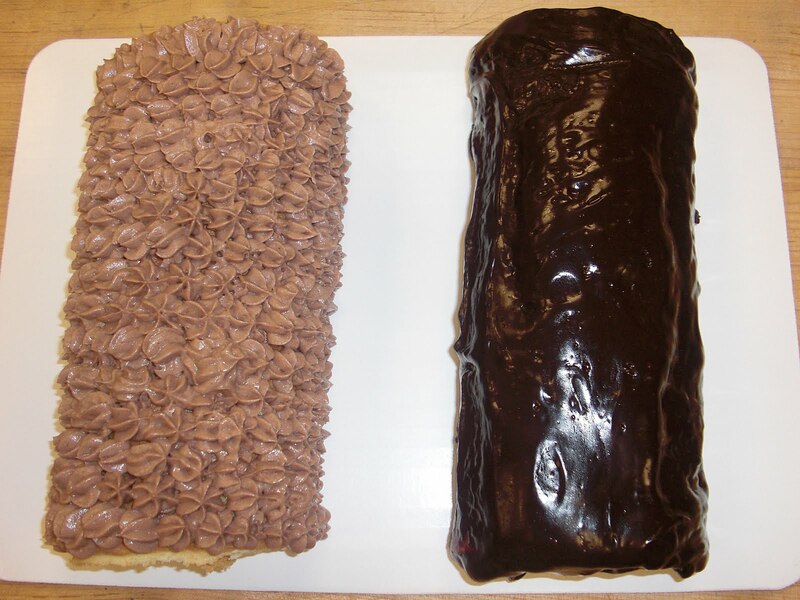 I didn't take pictures, because next class we're going to frost them, so I thought I'd save it for next time. 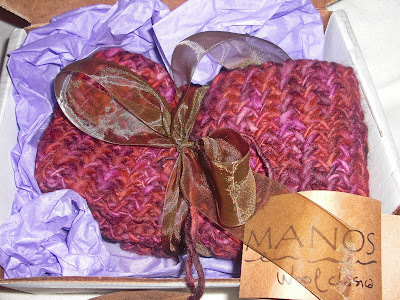 For this post, I'm going to let my little sister, Margaret, take the reins. She recently got back from a trip to Mexico, and I thought it'd be fun to give her a chance to share some photos with you guys. So, without further ado, take it away Margs! Hola amigos! I'm Margaret, Dani's little sister. You might remember me from the Margaret's 21st birthday trip post. 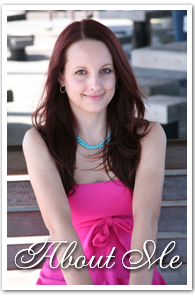 After sampling some delicious treats on my recent trip to la Ciudad de Mexico (the city of Mexico), Dani has kindly invited me to be her first guest blogger. So here I am- how could I resist such an offer? I went to Mexico City over my spring break with a class called "Mass Communication in Mexico" that I'm currently taking at UNC Chapel Hill. Now, if you know anything about the Craig family, you know that we plan entire vacations around our eating schedules. Naturally, my mouth started watering weeks before my journey. Unfortunately, the nature of the trip didn't allow me to seek out all the fabulous eateries I'm sure exist in Mexico City, but I did make a simpler mission for myself: eat some dope street tacos, get a hot churro, and drink some good Mexican tequila. 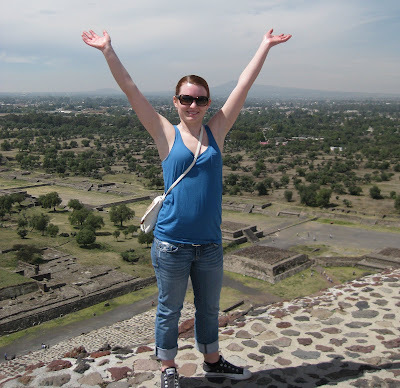 On the first day of the trip, we ventured out to the Teotihuacan pyramids, which are some of the largest pyramids in the Americas. This was probably my favorite day of the trip; the ruins were absolutely mind-blowing and there's not much better than exploring all day in the warm sun. 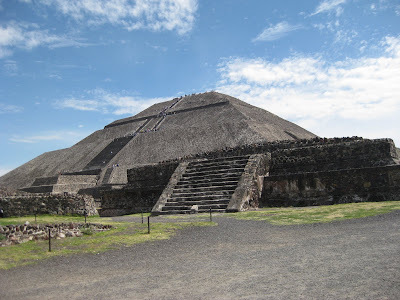 This is the Sun Pyramid, the largest of the group. The pyramids seemed to go on for miles! After checking out the pyramids all day, the whole group (all 12 of us!) went to a traditional Mexican restaurant for lunch. Thank goodness we had a few locals and a fluent girl (hey Marlene!) with us, because ordering was a chore! We all started with tortilla soup, which is a tomato based soup topped with crumbled homemade tortilla chips, fresh avocado, queso fresco, and some sort of delicious cream sauce. Even though it was a hot day, this soup was amazing! 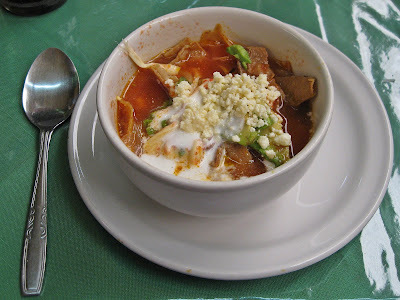 We tried a few other tortilla soups later that week, but none beat this one. 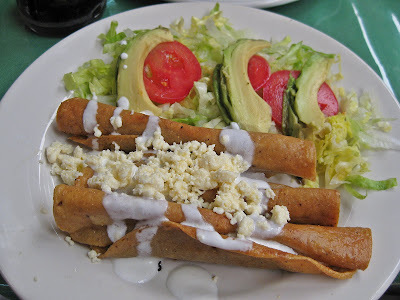 I also had some taquitos, which are rolled up corn tortillas filled with either cheese or some sort of meat and then fried. These were yummy, but I really just wanted another bowl of that soup! Everything was served with the best avocados EVER. We were, however, advised against eating fresh fruits and veggies that don't have a natural peel because they were washed in the water. Thank GOD for avocados having peels! 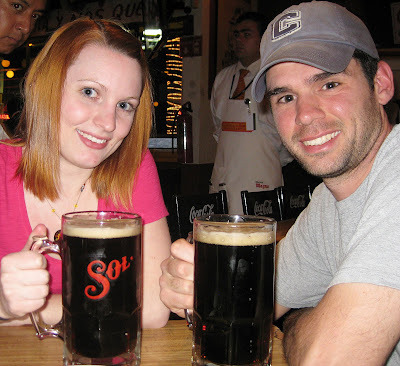 Later that night, a few of us decided to get some dinner at a place called Samborn's. I don't think there is an American equivalent to this place, but its kind of like a department store combined with a restaurant, a bakery, and a pharmacy. Kind of like an upscale Wal-mart, but with no clothes. 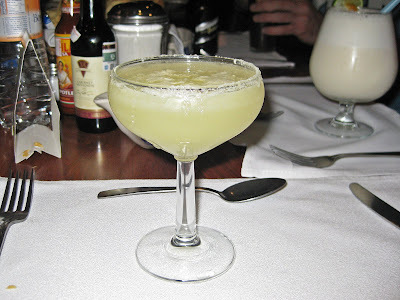 Anyway, I had my first taste of tequila in the form of a margarita there - fab! That's Marlene's pina colada in the background, which she said was fabulous. The second day we did a bunch of touring in the city, including Chapultepec Park which has Maximilien's castle and a TON of roadside tiendas (shops). After seeing the castle, we were famished and decided to stop at a taqueria. Hooray! Here is the sign for the taqueria we stopped at. 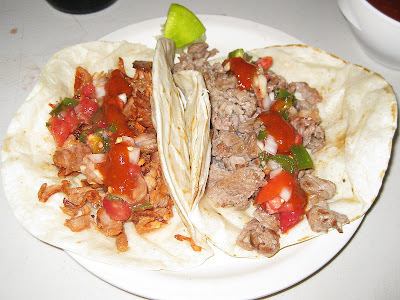 5 tacos for 15 pesos! By the way, 13 pesos roughly equals 1 dollar. CHEAP FOOD. I ordered 5 tacos and told 'em to give me 5 different kinds of meat. I was too hungry to figure out exactly what I was eating before I devoured every single one! 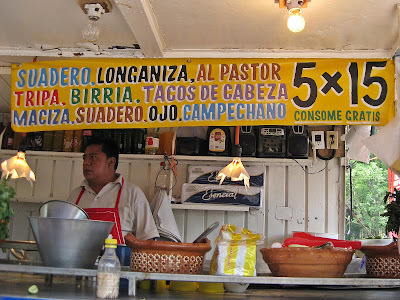 The sign has things like tripa (tripe), ojos (eyes), tacos de cabeza (tacos of the head), longaniza (sausage) and some others which don't have a clear translation, like campechano (hearty?) and birria (rubbish?). I could have ended up with some interesting things, but it was all tasty. Oh, AND mission one...complete! That night, after getting back from touring all day, I couldn't resist stopping in at another taqueria because I was starving. These weren't as cheap, but they came with a soda. 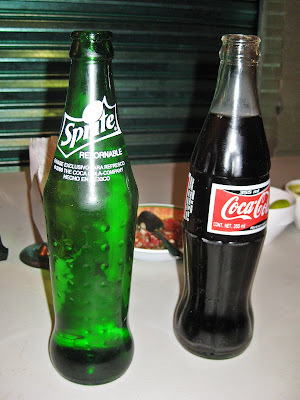 All the sodas came in glass bottles and were much sweeter than the American stuff because they are made with real sugar. These condiments were pretty typical of any eatery: salsa fresca, lime wedges, and 2 types of hot sauce. And the tacos! I had chorizo and steak. The chorizo was so good I ordered 2 more! My buddy Brian and I searched fruitlessly for some churros. Apparently, you have to specifically ask for the churro that you eat because, after asking about 50 different vendors and getting dirty looks from Mexicans all day, one guy was kind enough to let us know that churro is also slang for marijuana in Spanish. No bueno. Anyway, we finally found a place, and Marlene bought one for Brian and I. The only thing left: tequila! I know, I know, I already had a margarita, but that hardly counts. So, Brian, Zakiya, and I went out drinking one night. The bar special read something like taza por 84 pesos. We thought taza meant "pitcher"... turns out, it just meant GIANT mug of beer. The beer was called El Sol. It came light and dark, and I became pretty partial to both kinds in just one week. 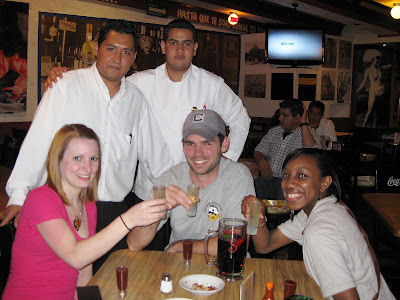 To celebrate finishing the huge beer, we had tequila shots! The tequila was strong, but I'm not really used to drinking it. They chase tequila with clamato juice, which I was skeptical about, but it was actually pretty successful. Mission 3: success! I ate a lot of great food. I wish I would have taken more foodie pictures including the amazing gelato Brian and I got one night (I had cookies and cream and coconut, he had queso and chocolate) after we had tacos at another taqueria. 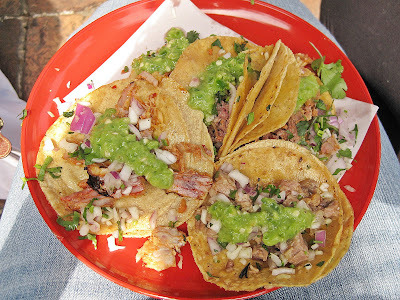 I had tacos de lengua (tongue!). So weird seeing a huge tongue being sliced in front of you, knowing you're about to eat it, but it was actually really delicious. So, thanks for letting me borrow Dani Dishes for a little while! Hope you enjoyed my post. Eat well, friends! Viva la Mexico! 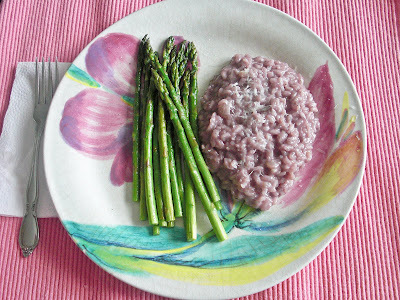 Daring Cooks' March Challenge: Risotto! The 2010 March Daring Cooks challenge was hosted by Eleanor of Melbourne Food Geek and Jess of Jess the Baker. 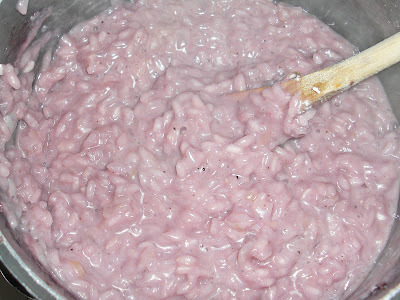 They chose to challenge Daring Cooks to make risotto. The various components of their challenge recipe are based on input from The Australian Masterchef Cookbook and the cookbook Moorish by Greg Malouf. 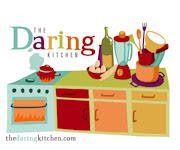 Hey guys, I feel awful that I had to post this challenge late (Daring Cooks are supposed to post on the 14th of each month!). I've been so busy that I put it off til the last minute, and then the past few days I've been stricken with a nasty little spring cold. 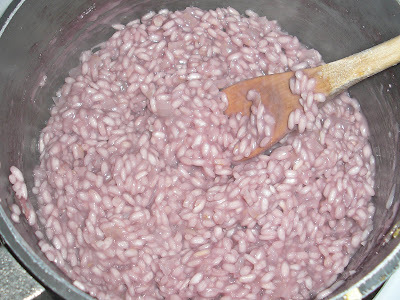 So, I'm sorry, but I just haven't felt like standing over the stove stirring risotto. But today, I'm feeling better and am dosed with DayQuil, so I got it done for lunch! I've been thinking about this dish since I first found out what the challenge was nearly a month ago. 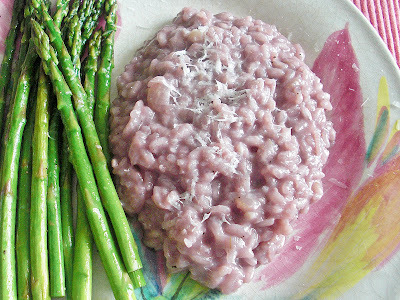 It's a red wine and goat cheese risotto with roasted asparagus. I really wanted to sear a few nice, fat sea scallops as a protein accompaniment, but that seemed a little overkill for lunch. 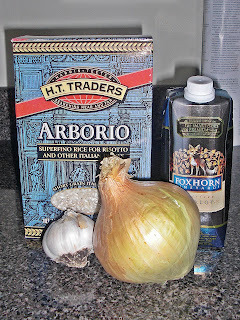 So, I went vegetarian (except for the chicken stock). 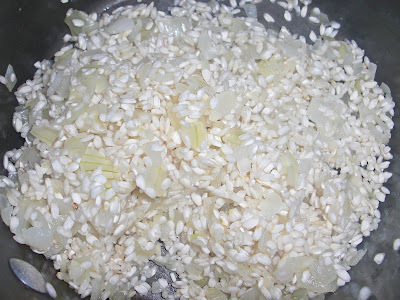 Start by sweating some chopped onion and garlic in a little EVO. 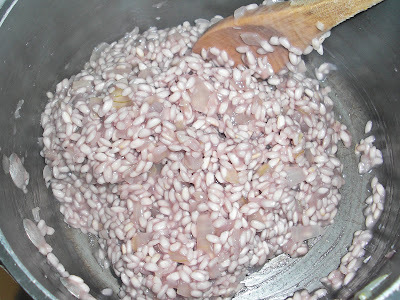 Add the rice and stir to get a nice coat with the olive oil. Add a generous splash of chicken stock and stir until absorbed. At first, this will happen pretty quickly. Although I didn't make it specifically for this challenge, I did use my own homemade stock. Repeat this step with red wine. Keep repeating the stock and wine process, stirring continually. Don't stop stirring for long. Not there yet! Keep stirring! You can stop when the rice has a nice, soft bite. I probably cooked mine a good 30-40 minutes before adding the goat cheese. Then, when you think you're done, add a bit more stock and wine for good measure, season with salt and pepper, stir a bit more, and you're probably good to go. As for the asparagus, just a toss with some EVO, salt and pepper, and into the oven it goes on a baking sheet at 425 until the tips brown. Sprinkle with a bit of lemon juice and yer done. Delicious! Thanks for the new plate, Margaret! Culinary School Update: Braised Cabbage, Cookies, Danishes, & More! Okay guys, it's school update time again! It's the middle of the semester, and we've been cooking up a storm. In cooking class, we've been making a lot of veggies. 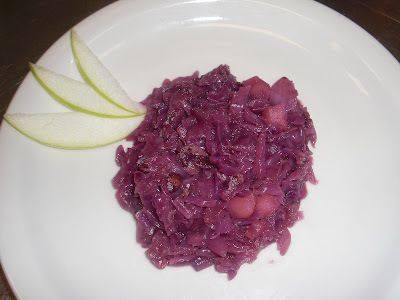 Last week, we made apple and wine braised red cabbage. I'm not the biggest cabbage fan, but this turned out pretty well and I was happy about it. 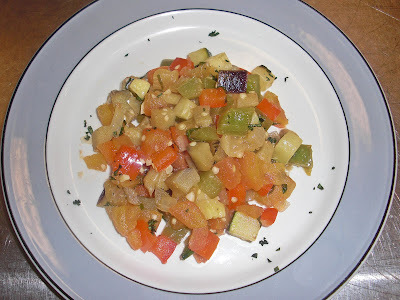 We also made ratatouille. It obviously would have been better with beautiful summer veggies, but we worked with what we had. 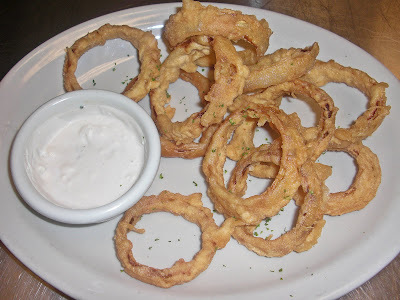 And, to get started on frying, we made onion rings and blue cheese dressing. 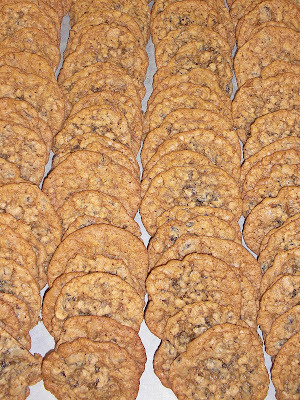 Other groups also made peanut butter and chocolate chip cookies. 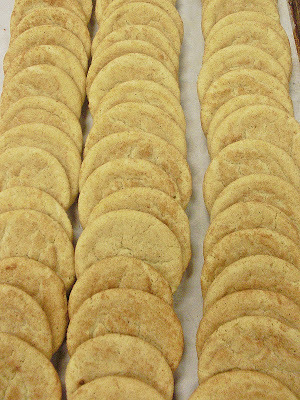 By the time we were done, I didn't think I could ever look at another cookie again. This week, we didn't have cooking class because of a short spring break. 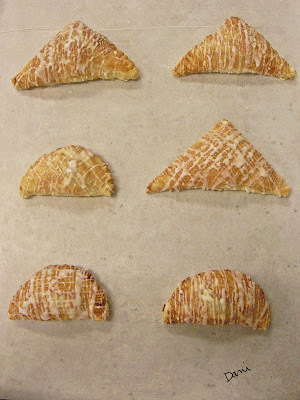 Yesterday, in baking class, we learned about laminated doughs, which include puff pastry, croissant, and danish doughs. 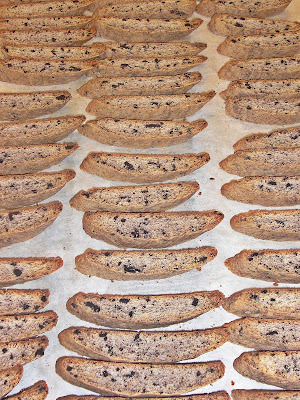 There's an entire class dedicated to laminated doughs, because it is such an intensive process. So, we just watched our instructor demonstrate how to do it, and used ready-made puff pastry and danish doughs to practice different ways to use them. With the puff pastry, we made apple turnovers. 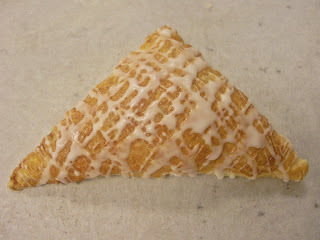 They were nice and flaky. 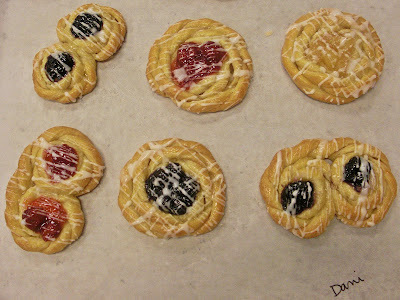 Even with the packaged danish dough, we had to roll, cut, and proof the danishes. We filled them with cherry, blueberry, and apple fillings. Then, we lightly brushed them in a marmalade glaze, and finally, they were drizzled with a simple icing. 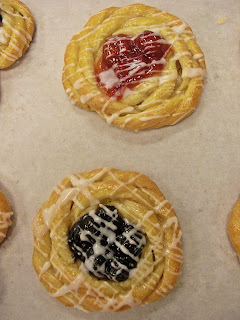 I usually think of danishes as being dry, but man, these were so soft and delicious. 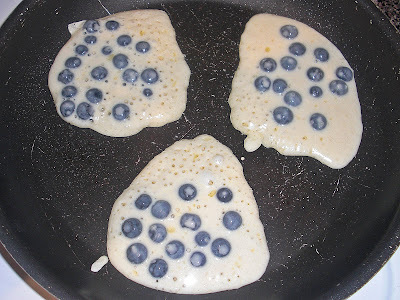 Okay, on to pancakes. I'm getting down to the nitty gritty, grocery-wise (pay day is tomorrow), but I did have this container of nice blueberries sitting in my fridge, begging to be used up. 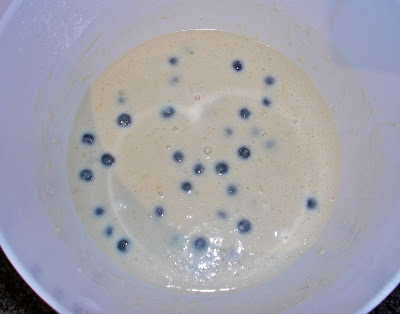 So, I decided to make pancakes from scratch. I know it doesn't seem like much, but I've pretty much always been a Bisquick girl when it comes to pancakes (or biscuits, for that matter), so this was kind of a big decison for me. 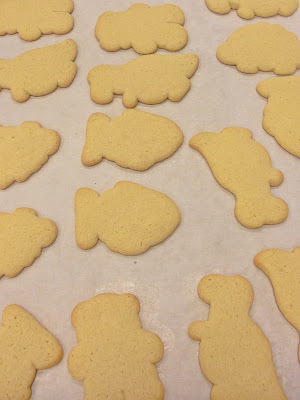 So, of course, I consulted good ol' Joy of Cooking, and was surprised at how easy they were! 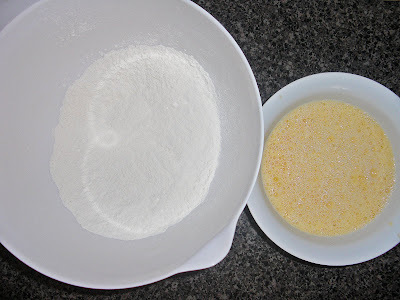 Whisk dry ingredients in a large bowl. Whisk wet ingredients in a smaller bowl. 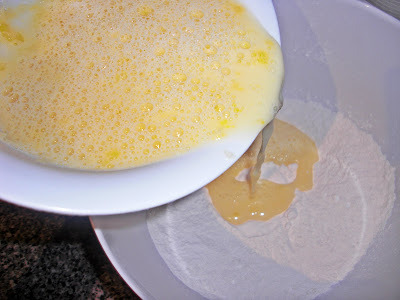 Pour the wet ingredients into the dry ingredients and whisk until just combined. Some lumps are okay- you don't want to overmix. 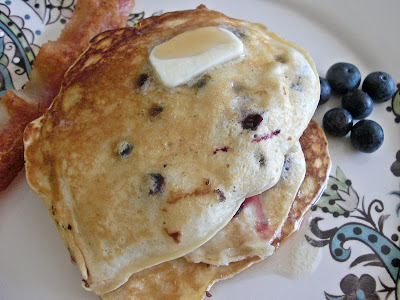 Make sure your griddle or skillet is very hot before you start to pour the batter. To test it, sprinkle a bit of water on the hot surface. If it hisses and sputters, it's ready. 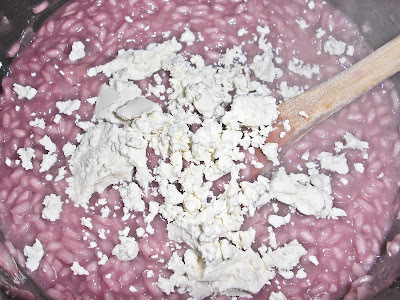 Drop batter by 1/4 cupfuls onto the griddle. They're ready to flip when you see bubbles forming. Serve with butter and syrup!